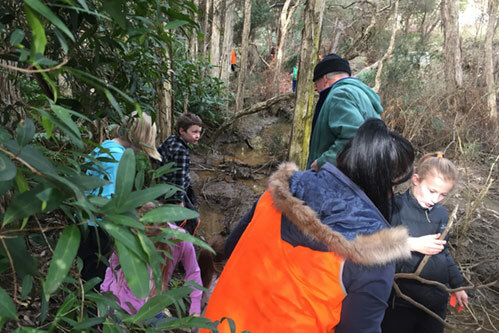 In partnership with the Devonport City Council and NRM Cradle Coast we ran a series of field trips to survey for the elusive Central North Burrowing Crayfish in December 2017. This project, from the Bookend Trust’s award winning science outreach team, is a combination of education and real science. The purpose was to introduce students and the community to field science techniques and contribute to a real monitoring program that will inform the understanding and management of the species in question. You can listen to more about how this project has developed from an ABC report from July 2015 when the concept was being trialled at Nixon Street Primary. We offered two excursion dates on the 7th and 8th December 2017 and then a community education day on Saturday 9th December. On the excursion teams of volunteers and scientists instructed and assist students to undertake the survey and other site observations. Participating schools/teachers will receive information prior to the excursion to prepare students. All field equipment will be supplied. This project will form part of the Bookend Trust's newly funded NatureTrackers proejct that will help communities get involved in threatened species monitoring and management. We'll post new developments for this project during 2019 at NatureTrackers.